Peterboy lives in a post-apocalyptic world--under the ground--the land of Dark. He lives there with his Grandpapa--in their hole in the ground, built with care and lit with love. Dark is not the most ideal place. It's broken and battered and ruined and jammed with lost and unspoken memories of a world long ago ... when all was bright and beautiful. The children of Dark, including Peterboy, rarely venture to the surface--to the Finding Fields--where they scavenge for things to bring back down below. One particular day, when Peterboy goes searching for something to bring the spark back to Grandpapa's eyes, he comes across a duck. A broken duck. Grandpapa isn't happy. There are more than enough mouths to feed, and ducks, you see, are full of wanderlust. She won't stay long. When she has healed, she must leave. And so begins a tender story of friendship, family, memories, and reconnecting with the past in a way that heralds the future. 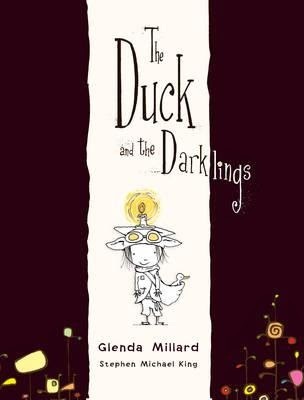 The voice and language Glenda Millard uses in this book made me both goosebumpely and grateful. It's so wonderful to see such creative and deliciously-placed text that hasn't been edited with a chainsaw or dumbed down to levels well beneath children and their inherent understanding of the nuance of language. I adore this story for its meaning but most particularly for its tongue-pleasing use of words and also for its unique Stephen-Michael-Kinging. This brilliant illustrator's stream-of-consciousness renderings include his iconic, spidery line drawn-people but also great smacks of black and block colour that hint at the contrast between dark and light, the past and the future. Expect lots of shiny stickers on the front of this book very soon.